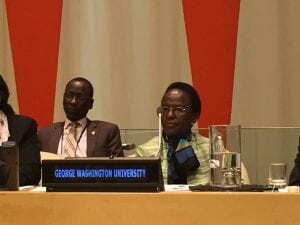 I am greatly honored and humbled by the invitation to participate at this year’s Africa week on “Addressing the Climate Change -Mitigation Nexus and its implications for Peace and Security in Africa,” as a scholar and practitioner in residence at the George Washington University’ Institute for African Studies. I wish to thank and congratulate the UN Office of the Special Adviser on Africa under the able leadership of my brother, Mr. David Mehdi Hanam, the Director and Acting Special Adviser, as well as the AU Permanent Mission and all the lead organizers for successfully organizing these important events showcasing Africa, and for facilitating our participation. Excellencies; The gathering here in this august body is a clear testimony that issues of climate change have taken a center stage for Africa’s development on peace and security. I applaud our leaders for their continued commitment to providing the necessary political leadership in addressing and ensuring Africa’s effective participation in various global fora on climate change and a call for action. Equally, I acknowledge the role of the African Union Commission (AUC) in upholding the African common position on climate change, which led to the successful negotiations and signing of the 2015 Paris Agreement. I recall the time when Tanzania former President Jakaya Mrisho Kikwete chaired the Committee of African Heads of State and Government on Climate Change (each time we would laugh at the abbreviation CAHOSCC), which underlined the need for Africa to speak with one voice and build a consensus on issues of common concern. I trust this is demonstrated here today in addressing the nexus of climate change to migration and its implications for peace and security in Africa. Excellencies, distinguished participants; Let me state at the outset that I am not an expert on issues of climate change with all its multi-layer processes and manifestations. My interest, which attracted me to this event, is a nexus of climate change to migration and peace and security in Africa. This, in my view, has been a missing link in the many debates on climate change and its implications. Nevertheless, I wish to recognize and appreciate the role played by Senegal during its presidency of the UN Security Council when, at its 7818th meeting on 22 November 2016, the Council highlighted for the first time the importance of climate change, peace, security, and migration. As has been widely observed, climatic changes not only impact directly on people’s lives, but also affect the security of their livelihoods in all its forms, including food security, water security, increased poverty, escalation of tensions and conflict situations at the local, national and international levels. Studies have shown that there is a convergence between environmental protection and conflict mitigation. It is a truism that we are currently facing the worst migration crisis fueled not only by conflict and wars, but also by prolonged drought, flooding and famine attributed to climate changes and other social factors. Allow me to draw your attention and bring you closer to home to the long enduring source of migration and conflicts in many parts of Africa, including pastoralists communities and farmers strained by the adverse effects of climate change among other factors. These problems, as described by one scholar, are as ‘old as humanity’ but have increased over time in magnitude and intensity. Semi-arid and arid areas are particularly exposed to the impacts climate change have on freshwater and grazing. With your indulgence, I wish to recall my time as the first Executive Secretary of the International Conference on the Great Lakes Region (ICGLR), which was established in 2006 following the signing of the Regional Pact on Peace, Stability and Development in the Great Lakes Region. Among the priority projects under the program of peace and security was the conflict mitigation and environment management in pastoralist communities in the Karamoja Region in Uganda, and across the border of Uganda-Kenya-Turkana (Northeast Uganda and Northwest Kenya); and Southern Sudan- the Toposa. As you are all well-aware, this region’s inhabitants are predominantly nomadic pastoralists. It is a region classified as arid or semi-arid that experiences prolonged droughts and poor soil conditions with attendant consequences- the livestock, which is central to the inhabitant’s livelihood, die and crops that were once able to survive in such conditions no longer grow. As desperation and the struggle for scarce resources intensify, inter-clan and cross border conflicts also intensify with national and regional dimensions and implications. A major alternative strategy, primarily for men under circumstances of severe resource scarcity, is migration and cattle rustling across boarders using arms. These weapons become a security threat to the lives and property of the region’s inhabitants and have resulted in countless deaths in the past few years. Women and children are traditionally left vulnerable to conflict and suffer the consequences. The same can be said for many displaced people and refugees fleeing their homes not only in times of war and conflict, but in search of green pastures. In the true sense of the word, as climate change manifests itself, weather extremes and disasters result. This is true for many regions and communities in Africa as no country is immune to these problems, whether man made or created by mother nature. Of importance and relevant to this meeting was our efforts in the Great Lakes region to promote innovative approaches to responding to climate variability and change, including the integration of the climate change risk management and environment protection in all our programs for restoring regional peace and stability and conflict mitigation, in addition to disarmament measures. At first, there was not much enthusiasm for these programs as we explored climate change impact and environment management with regards to pastoralist communities and conflict mitigation, or Gender, Environment and Climate change (and nexus to gender based violence). The truth of the matter is that climate change severely impacts inter-State and regional conflicts, which emerge due to water scarcity or poor management of structures, causing internal displacement of population, migration towards other countries or continents and unfortunate humanitarian consequences. For these reasons, it is our responsibility to step up our efforts to secure sustainable management of natural resources; design accountable sustainable strategies for the development of our continent and ensure the participation of women and youth when addressing the challenges of climate change and migration. Evidence shows that women and youth are the first victims of climate change in context of violent conflict, political instability and economic strife. Women are also agents of positive change with important perspectives and indigenous knowledge, which can inform and influence solutions to address climate change. In many communities in Africa that are already acutely affected by climate change, such as the Lake Chad Basin region, women have to adapt their lives to survive and care for their dependents. As a daughter of Africa, I am proud to report that in light of advancing women’s rights and leadership for the sustainable development of Africa, the African Union Commission, in partnership with the United Nations and the Federal Republic of Germany, launched the African Women Leaders Network of which I was privileged to be among the pioneers. This Women’s Network aims to bolster the leadership of women in governance, peace and security, all in the interest of transforming Africa, which includes initiatives to address the role of women with regards to the nexus between climate change, migration, peace and security. Furthermore, the Network has set the goal of generating sustainable and concrete actions for women in Africa, in line with the African Union and United Nations’ commitments to prevention and delivering tangible solutions on the ground. In this connection, solidarity missions have been undertaken a few months ago in Nigeria and the DRC under the leadership of the UN Deputy Secretary General, Her Excellency Ms. Amina Mohammed, with the goal of supporting women affected by the dire consequences of climate change and armed conflict. The majority of displacements were women, children and youth in various camps (Dalori Camp, Maiduguri, Nigeria, and Mugunga IDP camp in the DRC). Displaced women shared the hardship of their daily lives; the lack of access to basic human goods such as food and water, and the need for enhanced support from national governments and the international community. We all know the ‘why’, ‘what’ and ‘how’ through various efforts and international binding commitments. Therefore, we need to create harmony between humans and nature for sustainable development and lasting peace and security.